One of the restaurants that I’ve always wanted to eat at but have not gotten around to visiting yet is Bistro Moncur, located in Sydney, Australia. My good friend J, who runs the sumptuous blog Kuidaore, went there a while back and has raved about it ever since. Chef-owner Damien Pignolet is known for his exquisite, refined yet also classic renditions of French food. 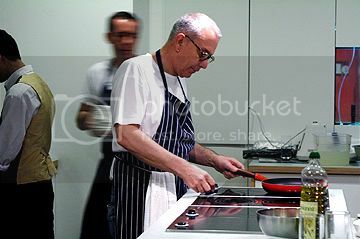 Many consider him to be one of the fathers of French cuisine in Australia. I had the pleasure this past week of not only meeting chef Pignolet but of eating a meal half-prepared by him, attending a cooking demonstration conducted by him, and sharing a lovely meal with him at Sin Huat Eating House. I say “half-prepared” because chef Pignolet cooked half of the dishes served at this multi-course extravaganza, while host chef, Chris Millar of Poppi, cooked the other half. All of the food was wonderful—chef Millar really out did himself with a delicious boneless, rolled and stuffed suckling pig course. But for me, the high point of the night was an amazing dessert that chef Pignolet calls “Eve’s Chocolate Cake.” Regular readers know that I’m not a big chocolate person. And because I tend to like milk chocolate a bit more than dark, my wife S, who is a real chocolate fanatic (snob), considers me a bit of a heathen. But I loved this cake. It was rich without being overpowering. And it had a wonderful light and semi-moist texture—derived from a combination of baked and unbaked batter (yup, unbaked… I’ll get to that in a moment). Sadly, because I was so incredibly stuffed, and because the Eve’s Chocolate Cake was presented as just one thing in a large dessert sampler (and greedy me wanted to taste everything), despite my taste buds spurring me on, I couldn’t finish the portion served to me. Luckily, just a few days later, I was presented with another heavenly slice. And not only did I get to eat every last crumb, but I also got to watch chef Pignolet make this dessert. Of course, in the hands of a professional chef who has probably made this hundreds of times, the process looked really simple. With my rather clumsy baking skills, I’ll probably mess this up somehow. The recipe for this cake and many more delicious dishes can be found in chef Pignolet’s gorgeously designed cookbook, French, which was just recently published by Penguin. The beauty of this cake lies in its texture. It has a wonderfully moist top which acts a bit like a sauce but isn’t (am I making any sense?). It’s actually unbaked cake mix which is spread over the baked cake. And since this cake is flourless, this unbaked mixture is essentially a chocolate mousse or pudding. Chef Pignolet explained to us that the recipe is named after his friend Eve, whom gave him this recipe in exchange for one of his. I urge you all to try making this and tell me how it turns out. I’ll be doing the same and hopefully (fingers crossed), my product will be as tasty as chef Pignolet’s was. Grease a 26-28cm springform cake tin and line the base and sides with baking paper. Preheat the oven to 150 Degrees C. Melt the chocolate in a bowl over a bain-marie of hot (but not boiling) water and then work in the soft butter. Beat the egg yolks with 30g of the sugar until pale. Then combine them with the chocolate and butter mix. Beat the egg whites until stiff but not dry. Then beat in 20g of the sugar until stiff. Beat ¼ of the egg white mixture into the chocolate mix. Fold this gently but thoroughly back into the remaining egg white mixture. Transfer ¼ of the cake mixture into a bowl and refrigerate. Pour the balance of the mixture into the prepared tin and bake for 30-40 minutes. It should remain slightly moist in the centre. To test, press the centre with your finger after 30 minutes – it should hold the indentation. When the cake is ready, invert it onto a serving platter. Remove the ring and base. Leave it to cool completely. The cake should collapse and leave a crater in the centre. Fill the crater with the reserved cake mix and scatter with the extra bits of chocolate. 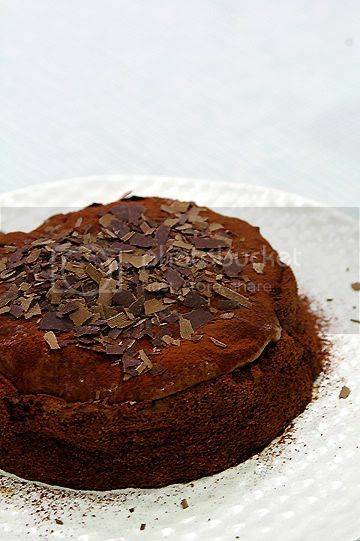 Dust lightly with cocoa and serve with whipped cream. Recipe comes from French, published by Penguin, copyright owned by Damien Pignolet. I was lucky to go to Bistro Moncur with my French in-laws a couple of years ago. It was one of those last minute decisions from a long list of must-go restos I had compiled for our holiday in Sydney. We, or more surprisingly, the beaux parents were enthralled. It was authentic high quality French food but somehow, my beau-pere said that it tasted cleaner, fresher, newer,…almost as if it was a re-discovery of the same old French dishes he has grown up with. For a place that’s supposed to be one of the top tables in Sydney, we were also Sooooo pleasantly surprised and relieved at how friendly and laid back they were even we had with us our son who was going thru’ terrible two’s at the time. (The day you have kids, you’ll notice being treated like lepers in restaurants – even tho’ ours are being brought up to be quite civiliised in restos). I regret that I didn’t make it to the dessert as I was too full. The cake recipe does not sound right…are you sure there’s no flour? not even a tablespoon??? Wish I went to the cooking demo. hiya, the cake is yum – super chocolatey without being overwhelming, like you’ve said.i await a taste of c.h’s d.p’s eve’s cake 😉 what else was on the cooking class menu? regarding the Miele show room…. i used to sell kitchen appliances… i loved the miele dishwashers, ultra quiet. I know this is completely random but can anyone tell me where I can get a Kitchenaid mixer in Singapore? You can buy them directly from the importers, Mayer Marketing (www.mayer.com.sg). Showrooms at Great World City, Parkway Parade, Plaza Singapura and a host of other locations. They are also sold at Sia Huat(www.siahuat.com.sg), a fabulous restaurant kitchen supply store on Temple Street. haven’t been here for a while. I like the new layout. Looks like you are still playing around with it. Are you going to put in advertisting too? I hope not…it’s nice without it. That dessert looks unbelievably good. There’s absolutely no flour in it. Promise. And it worked. He made it in front of us. The weight of the eggs is just to give you an indication of the size of eggs you should be using. They don’t literally have to weigh exactly 65g each. Here in Singapore, when you look at egg packages, they give you either the total weight of the eggs or average weight of each egg. As long as they are in the 60-something gram region, you should be alright. Glad you finally got your KitchenAid! I’ve got a yellow one too. It’s inauspiciously named Curdle. this cake looks divine! i’m no baker but whenever i see such pretty treats i start thinking that maybe i should try. trouble may ensue but this looks too good to skip. yumm. This cake looks great considering how it easy it is to make. tried the recipe. everything was good except cake didn’t collapse. any idea why? i used a square springform pan (size: 30cm diagonally). cld be coz the centre was slightly overdone? can’t be though coz the cake is soft and when cut, loses its structure especially in the middle. is this consistent with what u experienced too? however, the taste is just devine. and with so little sugar added, it feels less sinful! Damien actually ‘forced’ it to collapse by pushing down on the center of the cake. It seemed to work for him. This looks too delicious to skip! Is it possible for me to bake this cake 1 day in advance or it must be eaten on the day itself? How long can this be kept? Damien said that it is best savored on the day it is baked. In fact, he recommended that once you top it with the final uncooked batter, it should be held at room temperature — not refrigerated. In his opinion, it tastes best this way. I suppose if you make it in the afternoon and finish it off with the uncooked batter just before you serve it in the evening, it would be ideal. What a divine recipe! I’ve now had the pleasure of enjoying three of your recipes and each one was better than the last. Thank you, thank you, thank you! Thanks chubby hubby for this recipe, i tried it out for myself (finally) yesterday. I posted my pictures (BAD photography) on my site if you wanna see my take on the cake. 🙂 Thank you for the recipe. Brought the leftovers to work today, and everyone is raving about it.